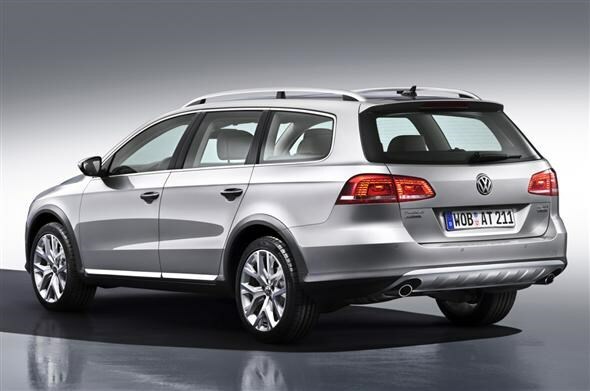 Volkswagen has revealed a four-wheel drive version of the new Passat, called the Alltrack. Making its debut at the Tokyo Motor Show next week, the Passat Alltrack is based on the all-new Passat Estate. It gets Volkswagen’s 4MOTION four-wheel drive system, and raised suspension, to improve its off-road capabilities. This could prove useful for those who occasionally have to travel to remote work sites, tow trailers across fields, or for those who drive frequently in poor weather conditions. Volkswagen has also given the car additional protection from scrapes and bumps. It gets steel front and rear under body protection panels, flared black plastic arch trims and beefier side sills. To help differentiate the car from the standard models, the Alltrack benefits from some minor cosmetic upgrades. Buyers get matt chrome roof rails, windows surrounds, grille, exterior mirror casings and redesigned front and rear bumpers. Despite the changes to the bodywork, the car is externally the same length and width as the conventional estate. Ground clearance, however, has increased from 135mm to 165mm. This rise in height also improves the Alltrack’s ability to drive on and off slopes without catching the bumper on the ground. The added weight of the 4MOTION system won’t cripple the Passat’s economy, although it will be slightly lower than conventional versions. As with all Volkswagen cars that have 4MOTION, the majority of the power goes to the front wheels. This reduces friction and aids fuel consumption. Only when the car senses that additional traction is needed does power get redirected to the rear axle. If necessary, almost all the power can be sent to the rear axle. Further bolstering the Alltrack’s capabilities is a dedicated off-road mode. This activates hill descent assist, which automatically brakes the vehicle when the angle of the slope is greater than ten degrees. This makes traversing hills, slopes and ditches more controllable. When the off-road mode is engaged, the ABS braking system and electronic differential lock functions are automatically adjusted to suit. Models with the dual-clutch automatic transmission will also shift in a different way when off-road, to make driving across rough terrain easier. The Alltrack will be available with a 138bhp 2.0-litre diesel with a six-speed manual gearbox, or with a 168bhp 2.0-litre diesel coupled to a six-speed DSG transmission. Standard equipment will include Alcantara trim, dual zone electronic climate control, cruise control, a tyre pressure monitoring system, MP3 player connectivity, Bluetooth connectivity and 18-inch alloys. No pricing has been announced yet, but the Alltrack is based on the current Passat estate Sport model, which costs around £28,000 in a similar specification. As a result, potential buyers should expect the Alltrack to cost in the region of £30,000. This pitches it against some tough competition. Skoda's Superb estate, already available with four-wheel drive, can be had for £24,795 with a 168bhp diesel engine and DSG gearbox - although admittedly it lacks the additional clearance. Alternatively, buyers who are looking for an off-road capable Volkswagen could consider the Tiguan, or other similar off-roaders, which is available for £27,650 in a similar specification. 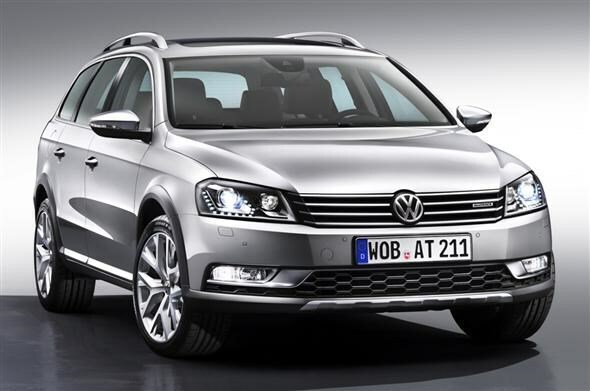 The new Volkswagen Passat Alltrack will be available to order in April 2012, with first deliveries starting in July. Did you know the most popular review for the Passat range is the Volkswagen Passat Saloon review.